Great glasses, at a great price are hard to find. Even with a simple prescription when you are adding up the frames and the lenses it can break the bank. I was super excited to try ordering from an online store called Firmoo. I had ordered glasses online before, so I was pretty comfortable doing so, and I know what frames look right for my face shape. So being excited to start I headed over to Firmoo and started my quest. I knew that I wanted to get full frames, and not metal. So after finding a great variety of selections. I was down to two. I decided on this pair. As you can tell from the picture at the start of the post, not too shabby! I knew I made the right decision when I wore them to work for the first time. Mind you they arrived at my door super quick. I would say I got them in about a week and a half. Sadly, that pair is no longer in stock, but the other pair I narrowed it down to is. Which, I have to say, because I love my glasses so much I’m actually going to order them as an additional pair. Especially since through tomorrow they are running a special, just for Friendspired readers to celebrate their 5th Anniversary. You can save 50% off by entering the code FIRMOO5Y. You can checkout through Paypal, which you don’t have to login to if you’d prefer to just use a credit card. Disclaimer: This review was made possible through a complimentary pair of glasses from Firmoo, I was not compensated in anyway. The review I provided was solely my own opinion and all of those opinions are 100% my own. Ever wonder why your dishes aren’t sparkling or shining after they’ve been washed in your dishwasher? Or perhaps why your glasses have streaks all over them? I know that I’ve been feeling lackluster for a little while now about the performance of our dishwasher. I’ve even asked hubs, is it the dishwasher, or is it us? Enter the Cascade Platinum Challenge! A perfect opportunity for us to figure out what it is we are doing wrong. First things first – Did you know there is actually a science to loading your dishwasher? No, I’m not talking about the rules that my husband thinks are the ways to load the dishwasher. I am talking about all of the myths that we blindly follow. Such as – Pre-Wash! Skip it!!! Did you know you could skip it?? You can, and let me tell you why, it’s because Cascade Platinum works it’s best when there is still food to break down. It has special enzymes that latch onto the food breaking it down so that it can wash away. If there’s no food for it to latch onto, it won’t do it’s job! You don’t even need to rinse it before going into the dishwasher. Just remove the large chunks of food and throw them away. Do NOT block the detergent chamber – you can stack your tall dishes in the back, so long as the chamber is not blocked. Fragile items on top rack. Thread any of your long utensils through coffee mug handles to help them stay secure during the wash cycle. Make sure that there aren’t any stray utensils that can block the sprayer. Load LARGE dishes on the bottom rack, face down so that the water reaches all the nooks and crannies. So, I had made a batch of brownies the night before, which hubby seemed to think were all for him! I let that dish sit the entire time with the dried up batter in it overnight. Waiting for our guests to arrive so we could show them the power of Cascade. I have to say, that is so against my nature, I’m used to soaking and then pre-washing before putting into the dish washer. While I was happy to have something done for prep before hand, that meant the next day it was time to just enjoy a few moments, before trying my hand at the Mac & Cheese recipe from The Pioneer Woman! With lots of starch, I was curious to see how these would stack up without any pre-wash! I’ll be honest, I wasn’t buying it. Next, some swimming was enjoyed by all. Some family time had. It was time to break out that Mac & Cheese. Surprisingly, for my first go at Mac & Cheese homemade, not from a blue box or with a shiny pack of liquid cheese – I’m pretty pleased with my accomplishment. It was also kid approved! After taking a break from swimming, seconds of the Mac & Cheese were had, and little miss was so messy she needed to be changed. Whoever thought a white onesie was a good idea, was crazy – that’d be Mommy! She looked like she did a cheese slip & slide. I’m guessing that the Mac & Cheese was loved so much, she decided to run around like a crazy lunatic and a bin on her head. Next was time for the big unveiling, and to see if Cascade Platinum passed the test! What do you think? I was super curious to see how everything would come out in the wash. So I couldn’t wait to check it out. Especially putting to use all the great knowledge that I gathered while prepping for the challenge. I was very excited to be a part of this program, and I truly learned a lot. Cascade’s goal is to educate people on how to achieve immaculately clean dishes every time they put them through a wash cycle. For more information, definitely check out Cascade’s Twitter and Facebook! I would love for all of our readers to put Cascade Platinum to the test in your own homes.Try it out and post your authentic review at www.cascadeclean.com/us/cascade/review using hashtag #cascadeshiningreview for a chance to win a prize pack. Enter below for your chance to win! Please share your experience’s with us by leaving a comment! Be sure to use #cascadeshiningreview when you share on your social media outlets! Disclaimer: This review was possible through Double Duty Divas and Cascade. I was provided with the featured product and supplies for the party in exchange for my post. The review I provided was solely my own opinion and all of those opinions are 100% my own. I got to check out the ClipSee. I was a little skeptical at first, but pleasantly surprised. My phone has a weird case so fitting in was a bit snug, but when I switched to a normal case it was no issue. There are even little guides for your fingers to help with the reversed orientation. For me the biggest thing was not having something to charge. I’ve used bluetooths before and either I left it on my phone which caused it to help drain my battery faster, or I forgot to turn off the ear piece and it was dead when I needed it. I keep it clipped to my visor and when I need it I can grab it easily. The sound quality was quite good. My husband could even clearly hear the kids in the backseat during our morning calls. Jenn even remarked, on numerous occasions how much better it was to talk to me. Normally she complains the whole time “I can’t hear you.” But she could tell immediately when I was using the ClipSee, it made that much of a difference. It took a little bit to get used to, but once I was familiar with where everything was flipped to I love using it. Another reason I love it, because I feel like it’s a much better and safer solution then me having the bluetooth on and holding it up. 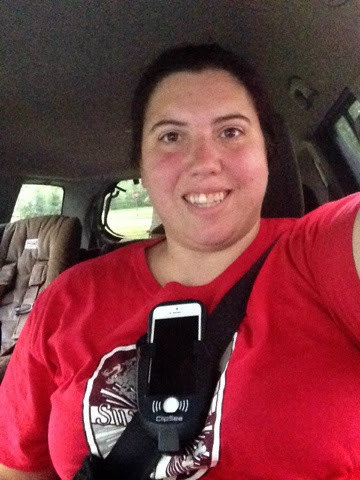 In the USA, at any given daylight time, approximately 9% of all drivers are engaged in a cell phone conversation while driving. Of these drivers more than 55% are not talking hands-free! ClipSee even shares their scientific data and sound technology as to why aftermarket bluetooth/speaker devices are not getting the job done – in their ClipSee Challenge. Check it out for yourself. 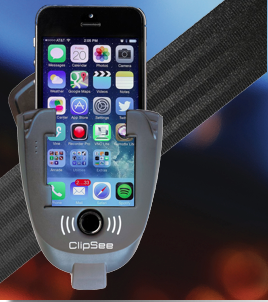 If you would like to try ClipSee for yourself, you can purchase it on Amazon for $19.99. Disclaimer: I was not compensated for this post, however I did receive the ClipSee as a review item. As always, all opinions are my own. To read our full disclosure click here.